The Shabby Stamper: New Occasions Mini!! I just got the SU New Occasions Mini in the mail. Three words: Oh my God!! Clear-mount sets and blocks? Recipe by Design? New, slimmer 2-part punches? (I love the Pinking Hearts border and corners, btw!) Love those epoxy brads and all the new ds, too. I need to get my order in as soon as the pre-order becomes live. I've been so busy this month that I haven't had any time to do any stamping. Hopefully, with some new goodies, I'll be so motivated to push chores and other holiday stuff aside! Here's what's been up lately. 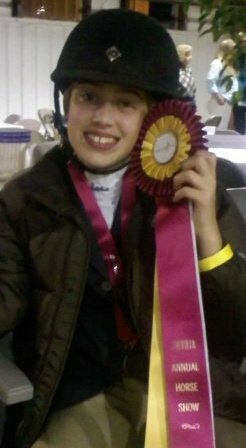 My daughter qualified and competed in the South West Virginia Hunter Jumper Association (SWVJHA) Pony Medal Finals on Busy Body Nora. She was Reserve Champion! So here's the new horse, Blessing! Congrats to your daughter, Pony! How old is she? What's an equitation? You can tell I don't talk "horse". I like them, though, and have ridden a number of times. She's 12, Susan! Basically, there are two types of hunter classes. The working hunters, which are supposed to be judged solely on how the horse moves and jumps -- basically how close they are to the judges' "ideal" hunter. This is VERY subjective! Equitation classes are supposed to be judged solely on the riders' position. Of course, if the horse messes up jumping the course, this reflects badly on the rider! This is also very subjective and political. You have to qualify to enter the Medal finals by accruing points in qualifying classes. Generally you do one jumping trip and the top 10 (or whatever number has been decided) go through to compete on the flat (walk, trot, canter) to win. Sometimes, there will be a 3d 'test' which will involve jumping a certain course in a certain way (hand gallop jump 5, trot jump 7, halt after jump 7 and canter jump 8) or will be asked to do 3 changes of lead while cantering up centerline -- something like that. does that help, or is it now clear as mud?? lol!